Vertical preheater system includes an integral “live” stone storage bin. Stone flows by gravity from the bin to the preheater modules through vertical chutes, (which also provide an air seal between the process and ambient). 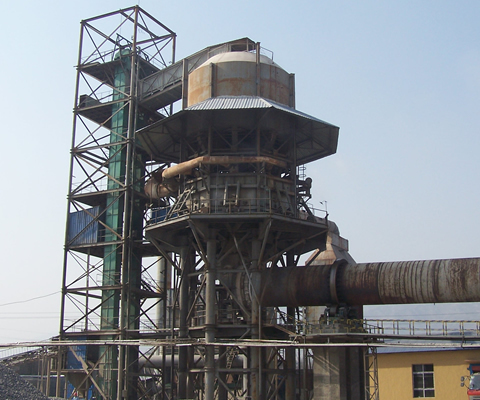 Kiln exhaust gases enter the preheater at 1010–1095 °C, to preheat limestone to 800℃ or more.The limestone is pushed out by hydraulic discharge mechanism and get into the rotary kiln through transfer slide for roasting and decomposition. Comparing with the traditional rotary kiln with the same model, the production capacity increases by 30%, heat consumption lowers by 40%. As these hot process gases pass through the preheater,heat is transferred to the bed of material within. This causes the release of 25–35% of the CO2 from the limestone within the preheater.The partially calcined mateirals is discharged from the preheater by controlled, sequential stroking of hydraulic plungers at its perimeter. The material then passes through the transfer chute and enters into the rotary kiln. Exhaust gases leaving the preheater have an average temperature of 230–260 °C and are typically filtered in a baghouse type dust collector, before being discharged to the atmosphere through a separate, free-standing exhaust stack.